From the award-winning designer of the iconic Penguin Hardcover Classics comes a beautifully illustrated fable about loss, friendship, and courage. The Fox and the Star is the story of a friendship between a lonely Fox and the Star who guides him through the frightfully dark forest. Illuminated by Star’s rays, Fox forages for food, runs with the rabbits, and dances in the rain—until Star suddenly goes out and life changes, leaving Fox huddling for warmth in the unfamiliar dark. 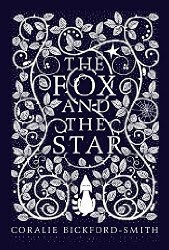 To find his missing Star, Fox must embark on a wondrous journey beyond the world he knows—a journey lit by courage, newfound friends, and just maybe, a star-filled new sky. The Fox and the Star is a charming little volume about friendship, loss, and deciding to find the strength to move on after that loss. The little fox loves his star, who lights the foxes way in the dark. Yet one day the foxes star disappears, and the fox is scared of the darkness and doesn't leave his burrow. Eventually the fox decides to be brave and face the unknown and discovers in his search that there are millions of stars to light his way. The real beauty in this book is the physical book itself. Coralie Bickford-Smith (who designs multiple series of Penguin's publications such as the Cloth Bound Classics series) designed (and wrote) the book, and her artistry permeates throughout. From the cloth-bound hardcover to the solid color Arts & Crafts influenced illustrations to the typography, everything about the book is just lovely.